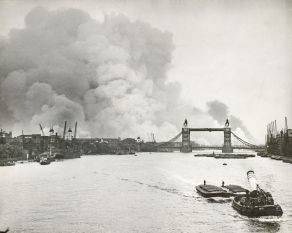 A photo taken during the Blitz of 7th September 1940, showing smoke rising from the London Docks and West India Docks. 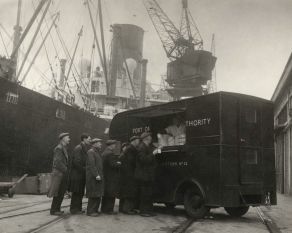 © Port of London Authority. 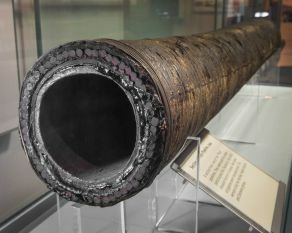 This column was discovered in the debris of London Dock in 1980. 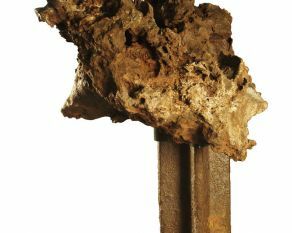 Its iron was melted in the fierce heat of the blaze caused by German incendiary bombs during the 1940 Blitz. This bombing of the docks set fire to huge quantities of sugar, in short supply during the war. 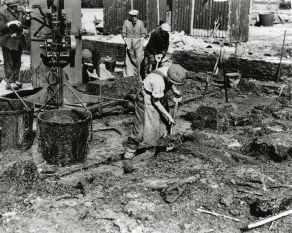 This worker salvages some of the solidified sugar from the wreckage. © PLA collection. 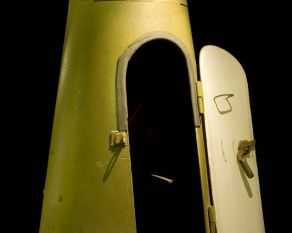 This bell-shaped air raid shelter is made from a single piece of steel bolted to a concrete base. It could hold two adults, protecting Port workers caught in an air raid from bomb blasts. 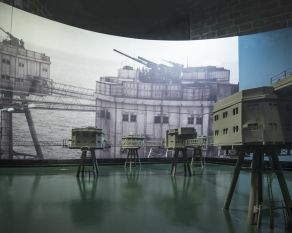 These armed towers were built in the Thames estuary during the Second World War, to guard the entry to the river against German planes and ships. 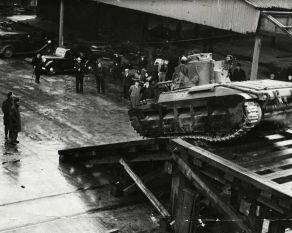 Tanks arriving in the London Docks prior to embarkation for the D Day beaches. The port of London was a vital supply hub for the invasion and liberation of France. © PLA collection. 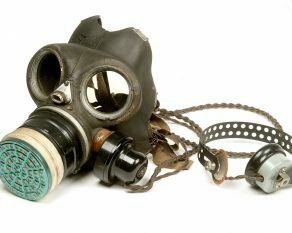 Telephone switchboard operators at the General Post Office needed to be able to work through an air raid, and were given these masks with built-in earpiece and microphone. 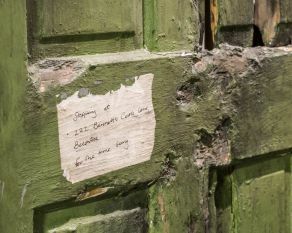 This artwork reflects an all too common sight in wartime London: the door of a family "bombed out" of their home, with only a short message to let friends know where they had fled. This is a surviving section of a 130km long undersea pipeline, that carried fuel across the Channel to supply the invasion of France in 1944. Learn more about the astonishing story. The gallery is on the second floor and can be accessed by lift.